The main aim of the training that took place at Hue University of Agriculture and Forestry (Vietnam) was to increase the targets of capacity building and training a higher number of people in terms of integrating climate change in research. 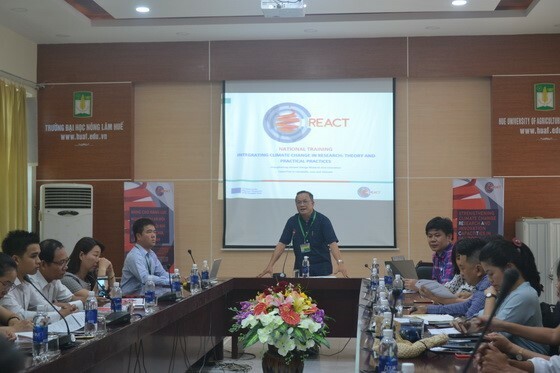 The training attracted about 50 participants including researchers and staff from HEIs (HUAF, HCM-USSH, Quang Binh University, Quang Nam University, Da Nang University, Hue University of Sciences); Master students; and managers and policy-makers coming from Public and Private Sector. At the training, the presenters described contents related to Integrating climate change in research: theory and practical practices. The participants commented and discussed on the topics actively.